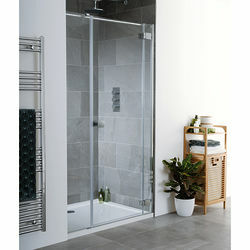 Lakes Island > Cayman Frameless Hinged Shower Door & Panel (1400x2000). Lakes Island Cayman frameless hinged shower door with in-line panel and 8mm glass (1400x2000mm). Size: 1400W x 2000H mm. Width adjustment: 1360 to 1405 mm. Other 801 Door sizes may be used to create alternative enclosure sizes (sold separately). Lifetime Guarantee: Lakes Bathrooms give a lifetime guarantee on this shower door.